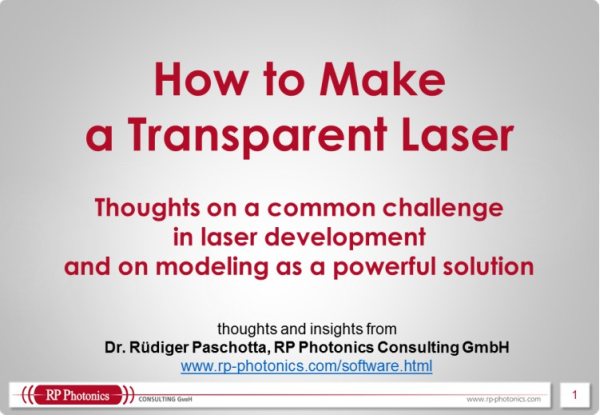 Ask RP Photonics on any issues concerning all-solid-state lasers. All-solid-state lasers are lasers which rely on solid-state components not only concerning the gain medium, but also the pump source. Such lasers are solid-state lasers (bulk or fiber lasers) pumped with laser diodes (→ diode-pumped lasers). Excluded are e.g. lamp-pumped lasers, dye lasers, and gas lasers. For many practical laser applications, it is desirable to work with all-solid-state lasers, because they can have a robust and compact setup, a relatively high wall-plug efficiency and correspondingly low cooling requirements, and a long lifetime. They also often exhibit lower laser noise.